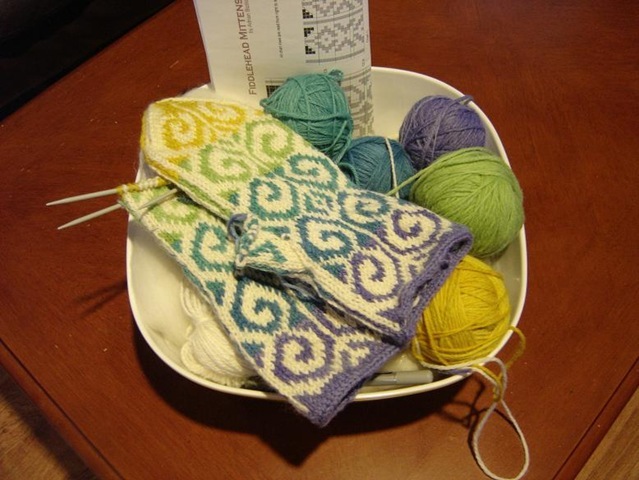 Fiddlehead Mittens? becoming ship shaped? erm Mitten Shaped? 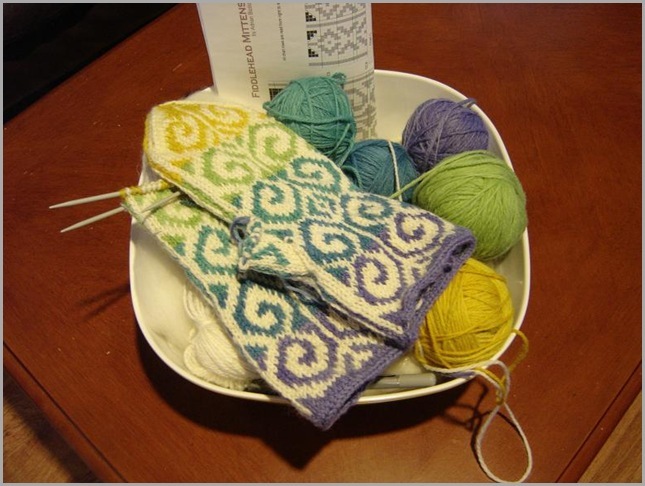 Over the weekend, I finally had a chance to tidy up the rest of the Fiddlehead Mitten yarn. I had finished the green singles last week, and had been letting them rest for a bit so that they would be easier to Navajo ply. I had also completed a bobbin of creamy natural white, also needing to be plied. I also needed to set the twist on the finished skeins. Since there really wasn?t that much left to be done before the cast on, I just went for it and got started. Funny how the promise of casting on a new project can get a knitter so excited? I plied like there was no tomorrow? 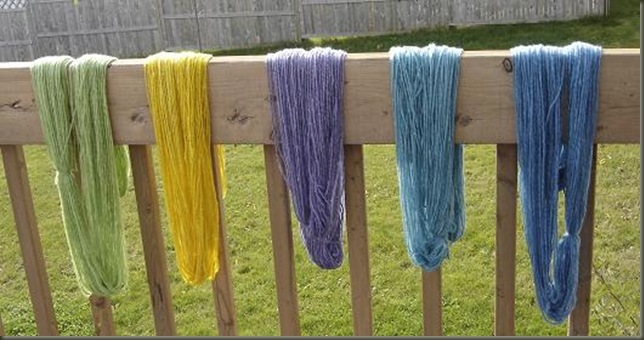 It was a chilly but sunny day, so I did my washing of the finished skeins (I suppose washing is a misnomer, I mostly just rinsed in hot water with a few drops of Apple Scented Dawn, probably not enough soap to be considered a washing?) With the light breeze, the skeins were dry in no time. I think I really achieved the feel I wanted with the woolen-spun yarns. The skeins were light and bouncy, and very soft. During the spinning progress, I had been concerned that perhaps the slight uneven-ness in my spinning might show up as uneven points in the knitting, but I am quite happy with my results. Overall, the cream yarn and the colors meshed together quite nicely, and the gauge throughout the mitten seems fairly consistent. (It?s a little hard to tell from the pic above, the way the photo was taken, things are a little skewed? some of my photos turned out a little too blurry to use unfortunately, I?ll have to be more careful with the finished mitts pics) The dyeing job also worked out as planned ? a Rainbow of slightly heathered yarns in a progression of colors. Hopefully this evening I can finish the top of Mitt #2 (before I forget exactly what I did with the first one) and maybe spend some time spinning up the rest of the lining (I think I have enough done for one lining, but not the second complete one. I loved your mitts! They are turning out great. I have to say I love being able to watch this process from beginning to end! You are awesome and can't wait to see them completed! Jolene, these look fantastic. What a great project from start to (almost) finish. You should be really proud of these. Thank you all I finished the second mitten last night, only thumbs and lining to go...but we all know how fast the lining will take shape with simple stockinette stitch. I think I will be trying more of these back-to-the-beginning style projects where I spin yarn to match a desired project. I really am enjoying the process of playing with the wool, then spinning, then knitting. The ultimate do it yourself!